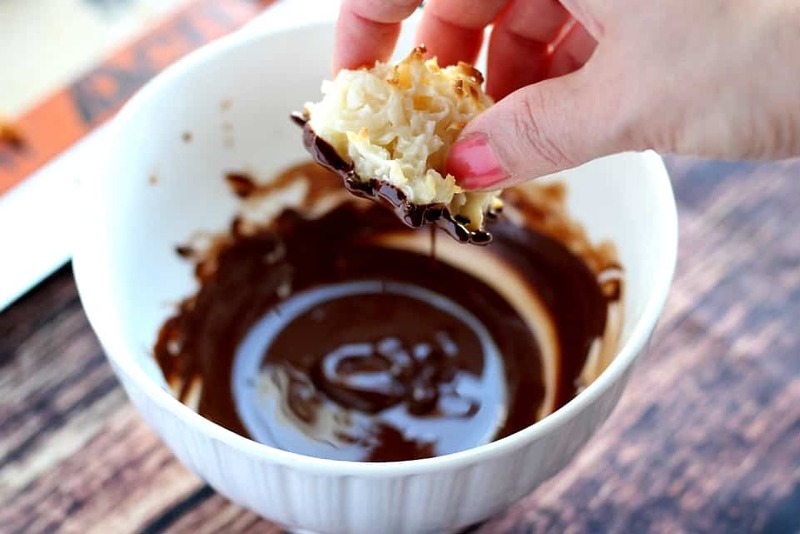 This Dark Chocolate Dipped Coconut Macaroons recipe is so simple, you will wonder why you didn’t try making your own sooner! 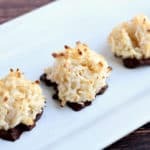 If you do a search on this blog for “coconut,” you will find a bunch of recipes in addition to this one for Dark Chocolate Dipped Coconut Macaroons. Can you believe that I hated the stuff up until just a couple years ago?! It’s true! I could not stand coconut! Not the taste, and surely not the texture. I can clearly remember trying chocolate covered coconut candy and not even finishing my bite before spitting it out. 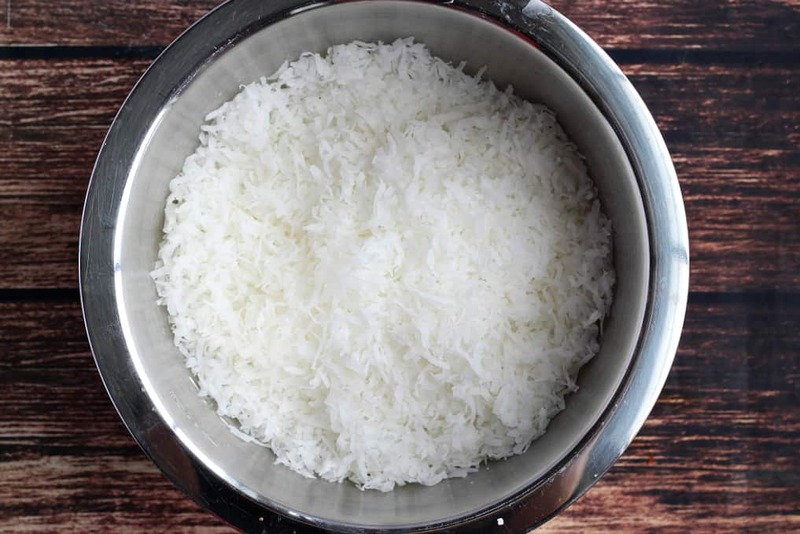 I can’t tell you exactly when I realized how delicious coconut is, but I can say with certainty that it all started with coconut shrimp, and then coconut rice. A lot of work was put into perfecting my own recipes for those two dishes, and today they are some of the most popular recipes on this blog! I thought it was about time to move on to using coconut in dessert recipes! There is the cutest little restaurant near where I used to work that has the best desserts! Whenever I would stop in for lunch, I would always buy a treat. Before long, I was passing up my beloved Chocolate Chip Cookies, and Peanut Butter Cookies, for a Coconut Macaroon whenever they had them in the display case. Ironically, the chocolate-dipped ones were my favorite! This recipe for Dark Chocolate Dipped Coconut Macaroons is an equally as delicious version, and unbelievably simple to make! You will need to have all your ingredients out, a medium sized bowl, a small microwave-safe bowl, a spoon, baking sheet, and I recommend using a Silpat mat. Preheat the oven to 350°F. Add the sweetened coconut shreds and flour to the mixing bowl and stir to combine. Then, add the sweetened condensed milk and vanilla extract. Mix well. The batter is going to be thick and sticky. Using a spoon, ice cream scoop, or your hands (my favorite method), scoop out and make 1-inch round balls. They don’t need to be rolled tightly, but I like to make sure there isn’t too much sticking up since my oven doesn’t cook as evenly as I would like it to. Bake for 12-15 minutes, until the tops start to turn light brown. 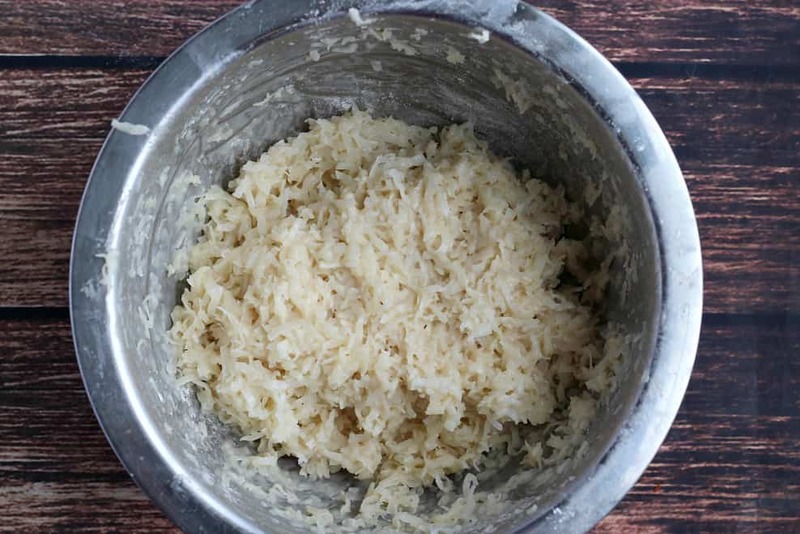 This will result in a coconut macaroon that has just a little crunch on the outside and is still soft and chewy in the middle. 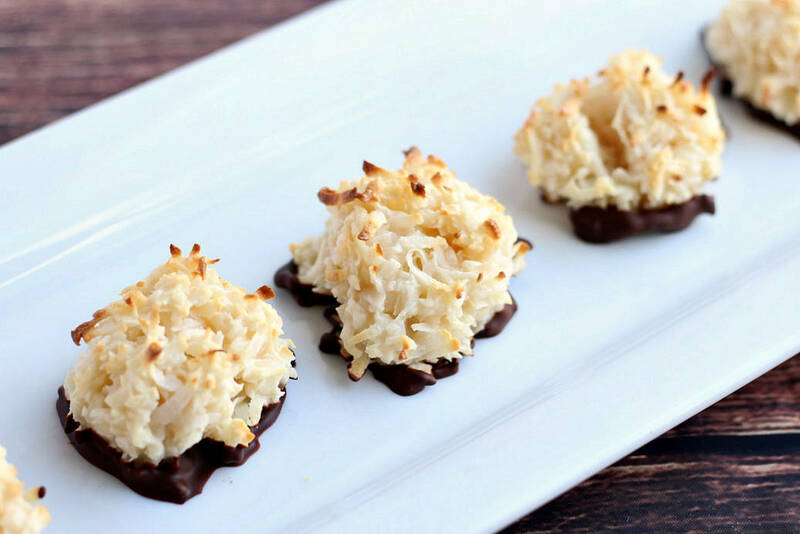 While these Coconut Macaroons are delicious right out of the oven, I think they are even better after a little dip in melted chocolate! I use 60% cacao bittersweet chocolate chips, but you can use any kind of chocolate you like! After the macaroons cool, melt the chocolate chips in the microwave for 30-second intervals at 50% power until completely melted, stirring between intervals. 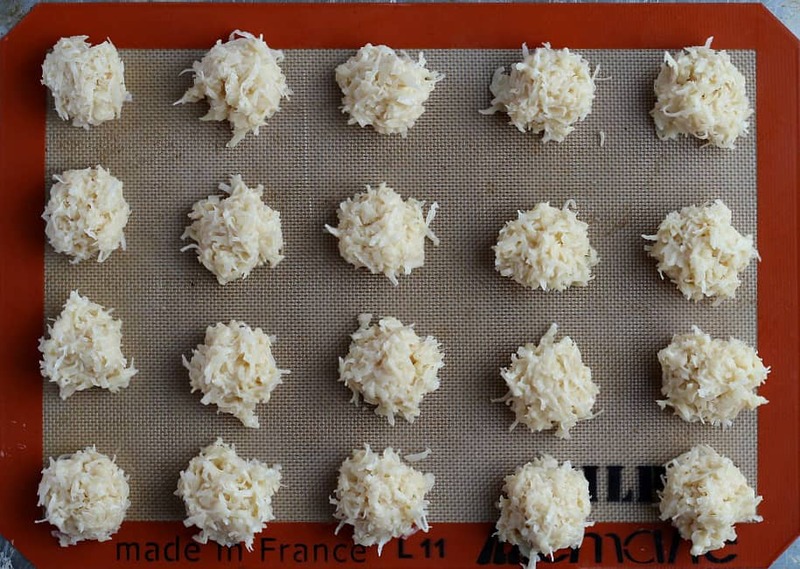 Dip the bottoms of each coconut macaroon into the melted chocolate and return to the baking sheet with a Silpat mat, if you have one, to set. Make sure the baking sheet is cool! Store in an airtight container. While I love a beautiful presentation, these look best in a simple setting. I just set them out on a white serving tray. They never last long anyway! I hope that you love these Dark Chocolate Dipped Coconut Macaroons as much as I do! This Dark Chocolate Dipped Coconut Macaroons recipe is so simple, you will wonder why you didn't try making your own sooner! Prep: preheat oven to 350°F. You will to have all your ingredients out, a medium sized bowl, a small microwave-safe bowl, a spoon, baking sheet, and I recommend using a Silpat mat. Combine coconut and flour in the medium sized bowl and stir to combine. Slowly add the condensed milk and vanilla extract and stir well. Batter will be thick and sticky! Using a spoon, ice cream scoop, or your hands (my favorite method), scoop out and make 1-inch round balls. They don't need to be rolled tightly since they won't spread when baking. Bake for 12-15 minutes until just lightly browned on top. Let cool. After the macaroons cool, melt the chocolate chips in the microwave in 30-second intervals at 50% power until completely melted, stirring between intervals. 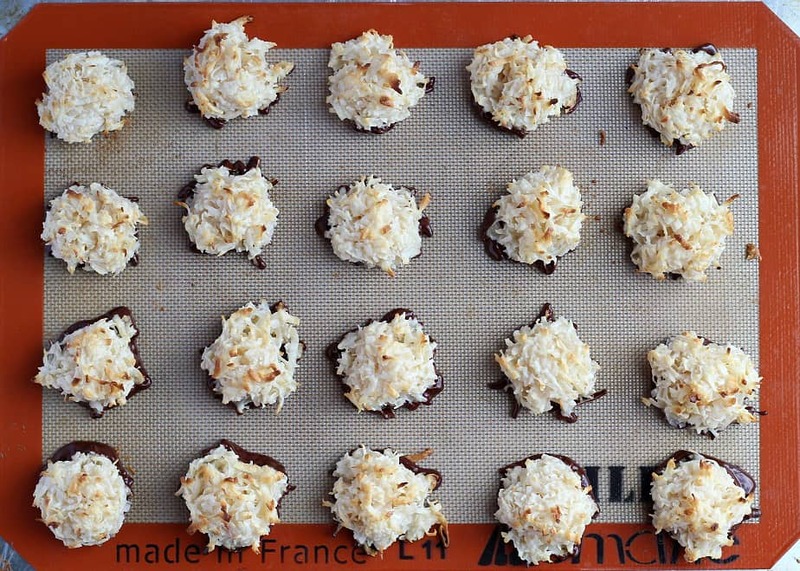 Dip the bottoms of each coconut macaroon into the melted chocolate and return to the baking sheet with a Silpat mat, if you have one, to set. Make sure the baking sheet is cool! Store in an airtight container. I love, love, love macaroons! And adding chocolate? Oh my so yummy! And both chocolate and coconut are good for you. So, by popping one or two of these delicious cookies into my mouth I’m actually helping my health. Oh, these are so pretty. 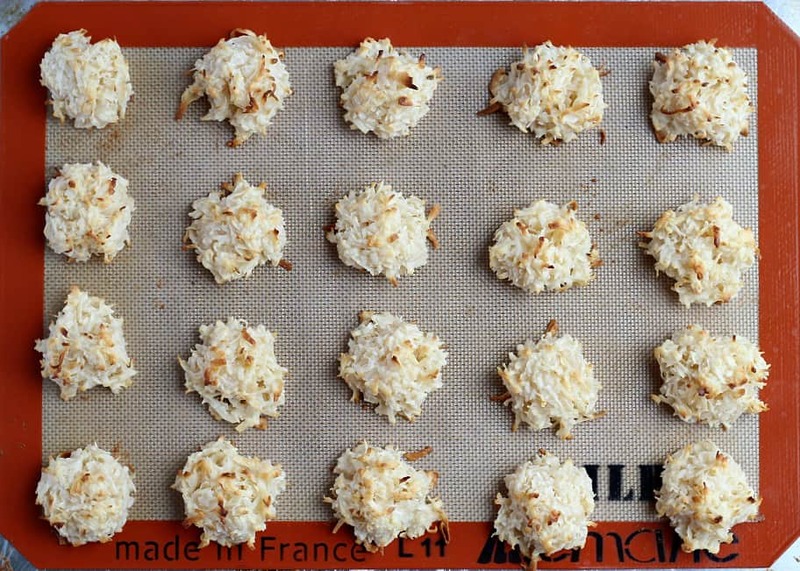 I love coconut macaroons and these are perfect. The combination of chocolate and coconut I think is very exotic. I love macaroons, actually, just about everything with coconut. I haven’t had these in forever but they would be the perfect cookie to make for the upcoming holiday cookie swaps. this is my weakness in any kind of dessert cookie. I love coconut these are more than over the top decadent! Wow, I want to eat it every day! I’m sure this is very tasty. This is an amazing dessert for my children. This sounds like something I need to try. I really like. Hi Fiona! Not sure if you got my email, but I wanted to answer your question here as well. I do use all-purpose flour for this recipe. I have not yet tested it with any other types. I hope this helps and I hope they turn out great for you!